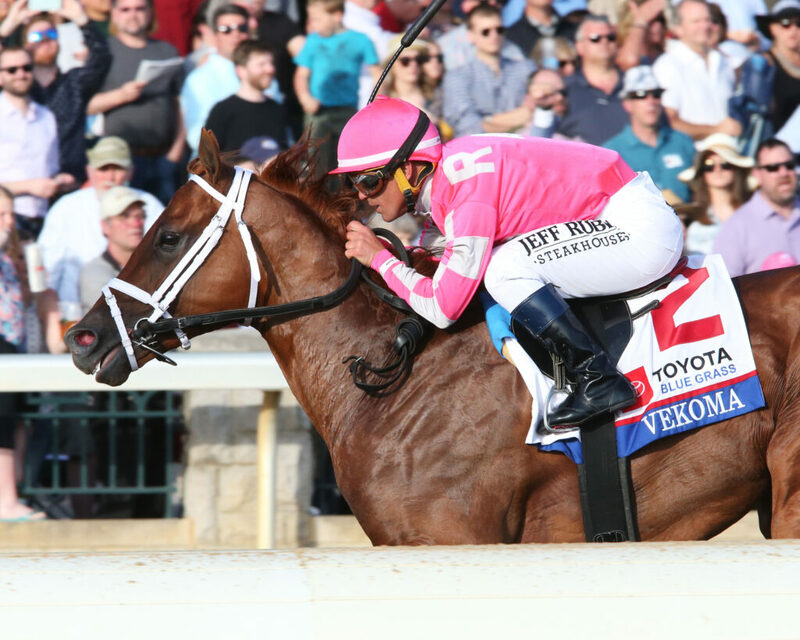 LEXINGTON, KY (April 6, 2019) – Gatsas Stable and R.A. Hill Stable’s Vekoma took command from Somelikeithotbrown in the middle of the far turn and went on to post a 3½-length victory over Win Win Win in the 95th running of the $1 million Toyota Blue Grass (G2) for 3-year-olds before a crowd of 34,775, a record for an opening Saturday of a Keeneland meet. “The last start, there was a pretty fast pace, and I told (Fountain of Youth jockey) Manny (Franco) to be conservative the first half-mile,” said trainer George Weaver, who grew up in Louisville the son of a racing fan who took his boy to Keeneland for Blue Grass Day every year, back when the stakes was on a Thursday nine days before the Kentucky Derby. 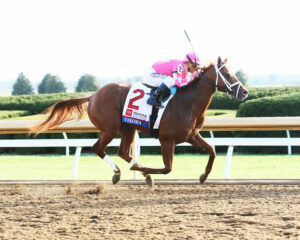 “I talked to Javier (Castellano) before this race, and told him I wasn’t so worried about that. I wanted to know if he can go the distance. He’s got great tactical speed, (which) put him in a spot going into the first turn and just ride him natural. Vekoma covered the 1 1/8 miles on a fast main track in 1:50.93. It was the first victory in the race for Weaver and Castellano. Vekoma became first horse since Coaltown in 1948 to win the race in only his fourth career start. 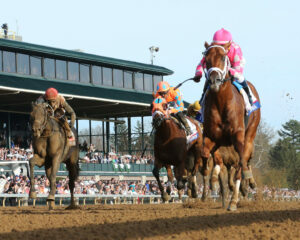 Said Castellano: “I like the way he broke out of the gate. In the first turn, I realized I didn’t want to dictate the pace. I tried to ride a smart race. I didn’t want to be too aggressive early; you have to save something for the end. So we tracked it. I liked the way he rated the first quarter mile, and I liked the way he finished. Every time I asked him, he kicked on a little bit. It was another three-quarters of a length back to Turfway Park’s Jeff Ruby Steaks winner Somelikeithotbrown in fourth with Chess Chief, So Alive, Sir Winston, Admire, Moonster, Lucky Lee, Market King, Aquadini, Dream Maker and Parsimony following in order.